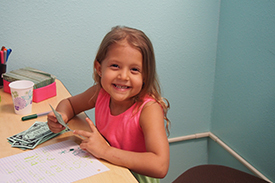 Zoo-phonics® utilizes a whole brain approach to teaching language. The method was developed to turn non-readers into strong readers using “phono” (hearing), “oral” (speaking), “visual” (seeing), “kinesthetic” (moving), and tactile (touching) – a whole brain approach. Through the use of a concrete method of presentation, children quickly learn the sounds of the alphabet and advanced phonemic concepts. Zoo animals are drawn in the shapes of the letters to increase symbol recognition. Then “signals,” or gross motor movements, are taught with alphabet letter. As well, since 95% of all reading is lower-case letters, these are taught first. Capital letters are taught after lower-case letters are recognized with 75% accuracy. Every aspect of Zoo-phonics® has been field tested and found to be extraordinarily effective with English language tutoring. This incredible program is a kinesthetic, multi-modal approach to learning all aspects of language arts. The principles of Zoo-phonics® maximize understanding, memory, utilization and transference to all areas of the reading, spelling and the writing process, in a playful yet concrete manner.